Painting shadows on a face is different to suggesting shadows on buildings or a landscape. The beginner may treat both subject matter the same, expressing facial shadows as definite grey or black shapes on top of the skin color, resulting in dark pools or dirty smudges. How can the hopeful portraitist paint shadows that suggest contours on a portrait? Portrait painting is often perceived to be a difficult subject matter to tackle. Little wonder when the face forms an important part of what we see. Our brains are highly sensitive to interpreting facial expressions or judging the character of someone by their features. The smallest deviation regarding an outline or a shadow will affect the overall appearance. In the case of painting, the portrait may no longer resemble the person portrayed. Our brains will not forgive these crucial deviances, and when it comes to shadows and contours, getting it right is ever more crucial. The beginner may experience difficulty in suggesting subtle contours on a face; a harsh dark shadow inhabiting the edge of the nose looks like a blotch; cheekbones appear as dark hollows making the person appear gaunt. The portrait may otherwise appear flat, with wishy-washy shadows that fails to inform on the facial contours. How can the portraitist paint convincing shadows on faces in oils? Well, firstly, the problem needs to be identified. This means stepping back and evaluating the method used in portraiture. View my shading technique when painting this angel from Da Vinci's The Virgin on the Rocks. View how the first glaze of this oil painting was completed. Applying ‘skin tone’ or ‘flesh tint’ over the prevailing areas of the portrait painting and then overlaying a dark color on top, to express shadows, creating the illusion of dark pools over the face. Introducing black to a flesh color and using the resultant murky color to express darker areas on the face. Perceiving shadows as having definite edges. Expressing this view on the painting will make the portrait appear unnaturally harsh. Failing to observe how the edges of shadows blend into darkness, creating an unwanted patchy appearance to the face. Forgetting to check the portrait against the photographic resource, resulting in idealized notions of how shadows behave in portraiture. An example of idealizing is simply shading in one side of the face in an illustrative way. Taking a prosaic view of shadows, treating them as simply dark without looking for definite hues or reflected light within. Light is light; shadow is dark. Not standing back from the painting periodically during the painting process. The following tips might help the artist improve shading techniques on portrait painting. Take an overall view of the face and see how the shadows fit into the mid-tones and highlights like a jigsaw. See shadows as an extension to the other tones rather than as isolated areas of dark. Notice the nature of shadows’ edges. Some are abrupt, such as on the bridge of the nose; others are gradual, such as the cheek-bones and brow. Look for colors and reflected light within the shadows. Reflections from clothing or a nearby surface will cause light to reflect back into shadow. Shadows may appear definite on a photograph, by may actually comprise the most subject shift in hue. Introduce the dark color into the white when color mixing rather than the other way round. Shadows can in fact be suggested by simply cooling the color down as opposed to darkening it. Is the tone darker, or is the color simply cooler? Use a resource with high resolution that informs visually. Using a poor photograph with insufficient information could force the artist to fill in the blanks. A problem with the shadow area could be due to an incorrectly-illustrated highlight or mid-tone. Address all areas of the face to successfully diagnose the shadow problem. Basic Shading Techniques for Shadows on Portraits. There are various ways of suggesting shadows on a face painting. The following tips might help. A basic method of darkening skin tone is by introducing a conflicting color into a given color (cool into warm colors). For instance, a little burnt sienna mixed in white is great for suggesting warm highlights. Adding a cool color will tone it down or make it appear darker. A little burnt umber, pthalo blue or ultramarine can be added to this cream color to create subtle shadows, preferable to adding black or dark grey. Additional burnt sienna or a little alizarin crimson will enrichen this highlight color for a deeper hue. Applying two or more glazes over an oil painting forms an important part of oil painting and is great for deepening tones, softening blends and perfecting detail. Soft shadows can be suggested by the application of a translucent mix of oil paint onto the areas where shadows exist via soft sables. Blending out into the prevailing color is achievable by making the color mix more translucent. The addition of linseed oil will flatten out brush marks and retard the paint’s drying time, making it workable for longer. Clean sables are great for blending soft shadow areas. Deep shadows on a face can be suggested by chiaroscuro effects as seen in the old masters. Caravaggio and Durer were early exponents of this technique which simply describe dynamic shadows juxtaposed against dramatic highlights. If the face possesses high contrasts in light and shadow against a dark background, apply a dark color over the background to form part of the under-glaze first. Once dry, apply a more translucent wash of the same color over the under-drawing of the face (make sure the drawing is sufficiently dark to show through). 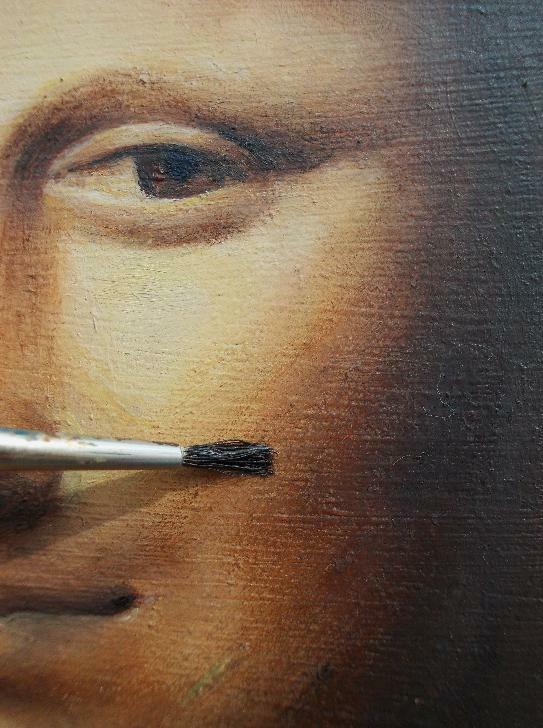 Applying under-glazes in this fashion makes it easier for the artist to key in the tonal shapes of the face. This is because the true tonal value of a given color is more obvious against a toned ground than a white art surface. This can be seen in the left image. I use acrylic paint for my under-glazes, as it dries quickly. Applying chiaroscuro effects means applying hues with high tonal contrasts, not taking a diffident approach. Lots of pales and darks will be seen against one another. Another technique is sfumato as seen in Da Vinci’s Mona Lisa. Sfumato is soft, smoke-like shading effects on the face with no lines. Sfumato can be achieved by dry-brushing a small amount of paint over selected areas of the portrait. Simply dust the tip-ends of a soft, but firm bristle brush. This dry brushing technique is great for refining shadow effect on the face on the closing stages of the portrait. What shape are they? Are they angular, rounded, resemble an object? What is their color temperature? Are they warm/cool, are they more or less neutral? What are their outlines? Do they shade out gradually, abruptly, a combination of the two (more likely). How does one shadow area compare to another? Are shadows bluer in bias around one side of the face than the other? Are they deeper in tone? Take care when illustrating shadows on children’s faces, as shadow shapes often appear fuller than those on adults. Shifts in hue and tone within the shadow will often be more gradual. I have found the following color mixes useful when mixing shadow colors on portraits. Take into account the issue of translucency/opacity. Remember to relate this color mix with the surrounding flesh colors. Soft neutral shadows. Equal portions of burnt sienna and ultramarine with white. Cool soft shadows: Less burnt sienna than ultramarine and white. 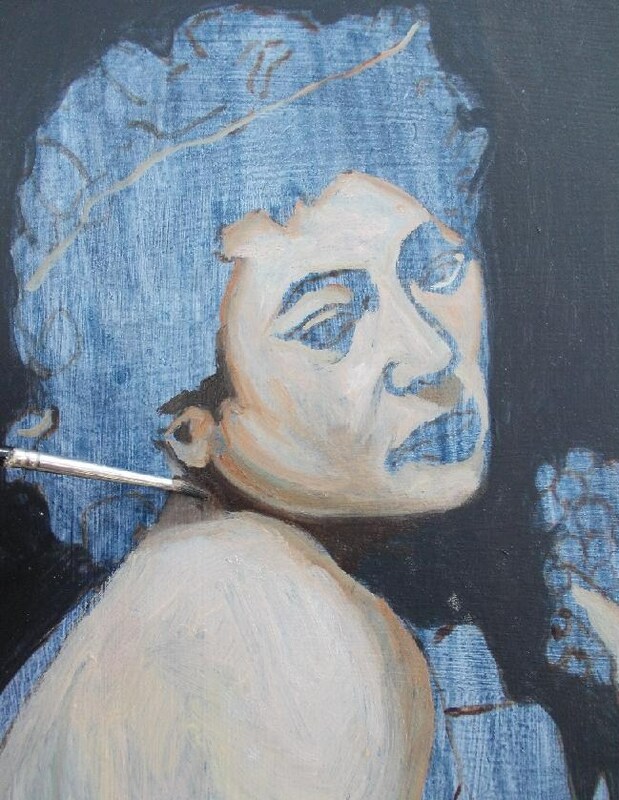 Alternatives are: pthalo blue instead of ultramarine; add a little burnt umber for extra depth. Experiment with staple pigments to see how they behave. As can be seen here, I use just a handful of colors to mix an array of shadow colors on flesh. These are: ultramarine, pthalo blue, cadmium red, permanent rose, burnt umber and burnt sienna. Other colors worth experimenting with are: cadmium yellow, alizarin crimson, carmine, viridian and cerulean. Had had a first attempt at a portait and achieved a suitably flat effect: - From spending less than 15 minutes looking at your advise and demonstrations managed to unflatten it and now see that achieving something recogniseable might be in my grasp! Many thanks. Great information! So glad I discovered your site. One thing, the white lettering against your black background, wreaks havoc on the eyes and can trigger migraines. Hope you can come up with something more soothing to the eyes. Thanks again for sharing. Can't think of a greater challenge than copying a leonardo. You have great knowledge and skill. Congratulations!